Support? Not If You Evaluate the Product! I ran into a snag last night - I imported a db schema (created via Visio / Generate) into a DB Pro project in VS 2008 Beta 2 DB Pro edition. Then I tried to build & deploy into SQL Express (the one that comes in the TFS / VSTS preconfigured VPC). And it balked. The error message on TSD158 I got wasn't like the one described in the MSDN Forums post Extending Timeout on SqlBuildTask, however, I decided to look into the registry anyways. Interestingly enough, the value for the key LongRunningQueryTimeoutSeconds was zero. Increased that to 120, restarted VS, presto: build is now working! The RSS functionality is enabled too in this version (I was running code directly from their repository last time around...). 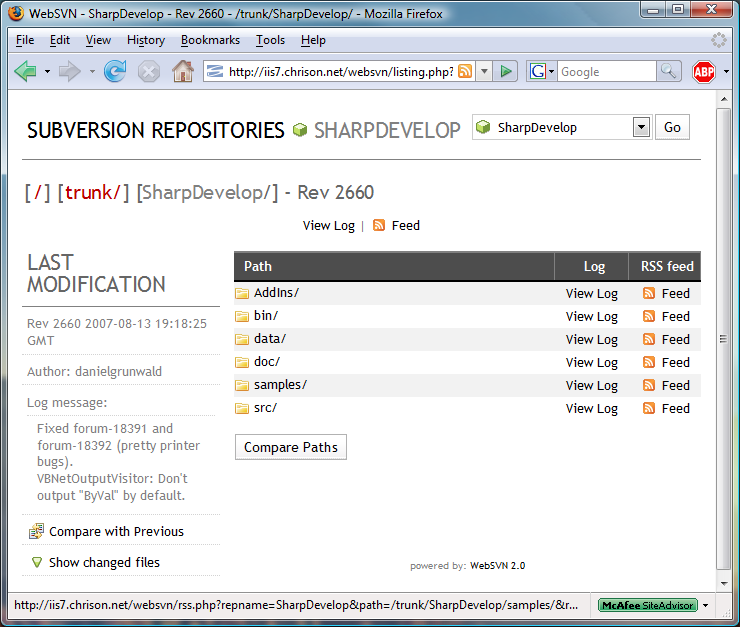 I have to say that WebSVN turned into a must-have tool for anyone using Subversion. Version 2 of the IE7 Desktop Security Guide is available for download. If you are interested in locking down IE7, then you will need this document. Yesterday, I adapted the code comment checkin policy for Team Foundation Server to work with VSTS 2008 ("Orcas") Beta 2. It is functionally equivalent to version 2.1.1 (download) for Visual Studio Team System 2005, therefore you configure it once for a team project, and then it is used both by 2005 & 2008. However, please note the parser doesn't yet fully understand all C# 3.0 constructs, so there might be "false positives". I set aside the entire day for reading the book Writing Secure Code for Windows Vista. And I was already able to put it back into the bookshelf thanks to its concise nature. The authors only tell the reader about "What's new and changed", without having people wade through tons of stuff they already know. I really greatly appreciate that the authors did not do a third edition of Writing Secure Code just for bringing developers up to speed on Vista security. Hint to book publishers: other areas would also benefit from this approach. There is only so much time to read books, and I don't want to skim through information I already know. Please consider catering to non-noobs by offering more of these "What's new and changed" types of books to us old dogs. Ohh-Kay. Let's go to RSA and their support center (it takes roughly five clicks to get to online support, but that's another usability story) - sign in required. Hmmm. How about creating an account? 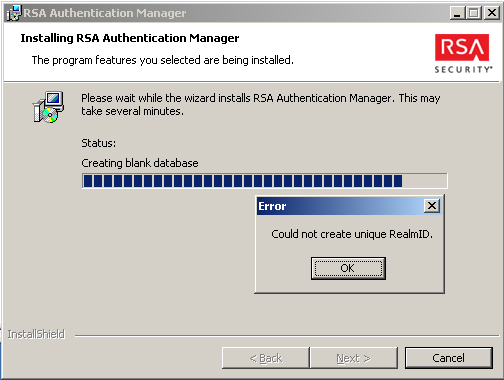 The eligibility is a real joke: "RSA customers who have a trial product (This does not include two user demos)". Excuse moi? On the Web site you told me that I was ordering a trial and in actuality it turned out to be a "2-User Promo Kit" (the moment I needed support I looked more closely on the package...) without support. Maybe it's the Microsoft Windows Server 2003 R2 Enterprise Edition VHD I am using? 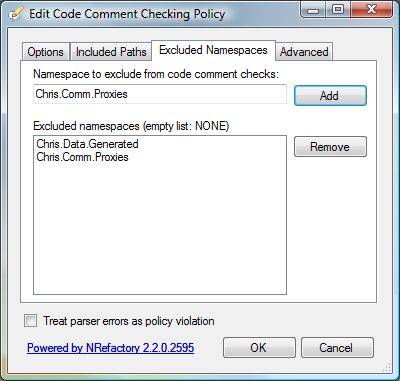 The check-in policy for TFS is revved to v2.1 and it comes with the "Included Paths" and "Excluded Namespaces" features announced earlier on my blog. The release announcement has more details; also, take a look at the screenshot tour of configuring CCCP. This is the most ridiculous message I have received so far on Vista. When I released version 2.0 of the TFS CCCP, I also previewed one feature of the planned 2.1 release: included source control paths. That prompted a comment by Klaus that excluding namespaces for eg auto-generated code (think CodeSmith or code generated by GAT / GAX guidances) would be a nice feature too. To do: testing, documenting, packaging. Today, I finally released v2.0 of the code comment checking policy for Team Foundation Server (TFS) / Visual Studio Team System (VSTS) 2005. Two major new features: firstly, you can extend the policy to do more restricitive checks (i.e. verify that the comments are actually in line with the number of parameters). Secondly, you now get an MSBuild task to compute "code comment coverage" during an automated build - independent of VSTS / TFS! I decided to go with include instead of exclude because it is much more explicit with regards what is being checked and what not. Currently, this is only available via source download.